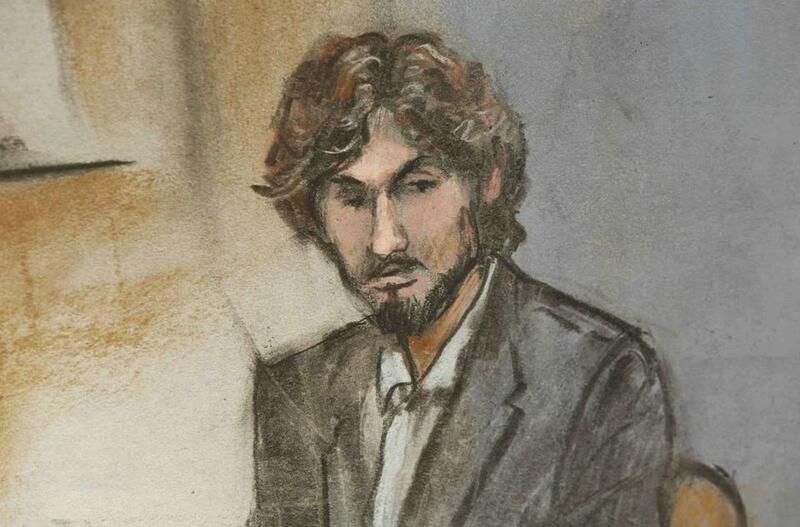 A courtroom sketched Boston Marathon bomber Dzhokhar Tsarnaev during his sentencing on June 24. Three months after jurors condemned Boston Marathon bomber Dzhokhar Tsarnaev to death, the federal judge who oversaw the trial has refused to release the names of the jurors, saying their identities continue to be a central part of the legal proceedings in the case. US District Judge George A. O’Toole Jr. on Monday rejected a request by the Globe to release the jurors’ names — a typical court practice in most cases. He said he will “ultimately” release the identities, but not until some of the ongoing legal proceedings surrounding the case are resolved. O’Toole’s decision is based in part on Tsarnaev’s lawyers’ requests to review the social media accounts of the jurors and their friends and families. Tsarnaev’s lawyers last week filed a motion to vacate his conviction and death sentence, and asked for a new trial. Such motions are standard procedure after any criminal conviction, but Tsarnaev’s lawyers have argued that their request is based on their concern that the jurors, all from Eastern Massachusetts, were influenced by publicity before and during the trial. Before the trial began with jury selection in January, Tsarnaev’s lawyers had asked that the trial be relocated to a district outside Boston, but O’Toole rejected the request. The defense lawyers have now asked for access to the social media accounts of the 12 jurors and six alternates in order to glean how much publicity about the case had passed through their social media accounts or was discussed by family members and friends. O’Toole said he will have to decide on the motion for a new trial — and the request for access to the social media accounts — before his jurisdiction over the case ends, so he will preserve the identities of the jurors until that time. The judge said it would be inappropriate to allow media outlets to interview the jurors while the lawyers’ request is pending. In a June court filing, the Globe had argued that the jurors’ names should become part of the public record of the case, but O’Toole said the delay in releasing the names will not hinder the media’s coverage. Some news outlets have interviewed jurors and granted them anonymity, but no juror has spoken publicly about the case and his or her service. Tsarnaev, now 22, is being held at the federal Supermax prison in Colorado pending his appeal, which will probably last several years. In April, jurors found him guilty of all 30 counts he faced related to the Marathon bombing, the shooting of an MIT police officer, and a shootout with police in Watertown. The same jury agreed to sentence him to death in May for the charges related to the bomb he placed near the finish line, a bomb that killed two people and injured dozens more. He was sentenced to life in prison for the other counts.